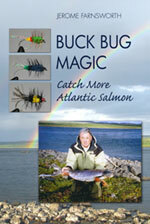 Jerome shares his tips & tricks for improving your fishing using Buck Bugs. I have been a fly-fisherman all my life. The fish I am fondest of are Atlantic salmon from any river. My educational and career background includes a BA degree from Trinity College in Hartford, Connecticut and an MBA from the Columbia Uiversity Graduate School of Business. I was a practicing CPA from 1975 until 1998. I retired in 1998 to devote my time to fly-fishing, writing, and photography. If the joy of fly-fishing is based in overcoming problems, then I have enjoyed some success. I don't know everything but every moment spent on the water provides me with opportunities to experience some frustration, overcome some problems, and learn something new. All photography and information on this site is the property of Jerome Farnsworth. It may not be used without written permission.